This Vancouver winter has been one of the warmest on record. As I write this, the sun is shining and the temperatures are in the double-digits (Celsius). Do you remember how warm it was during the 2010 Winter Olympics in Vancouver? This winter has been much warmer. So warm, in fact, that the three Vancouver local mountains have temporarily shut down due to lack of snow and an uncooperative weather forecast. Great news for many – terrible news if you like to play in the snow. So, what does one do when Vancouver’s local mountains melt in the middle of February? Head east to British Columbia’s Okanagan Valley, of course. Big White Ski Resort, located 45 minutes outside of Kelowna, has received over 70 cm’s of snow in the past 2 weeks. By comparison – Cypress Mountain in Vancouver, the venue for many Vancouver 2010 Winter Olympics events, has less than 45 cm snow base. Total. Seriously. How crazy is that? In an effort to salvage the brutal west coast ski season, we decided it was time to re-visit Big White, proudly labeled as Canada’s Favourite Family Resort. We’ve been to Big White a few times before, but not since our boys joined the team. The 6-hour drive from Vancouver is not short, especially with little ones, so we decided to make the trip worthwhile and booked 4 nights on the mountain. Ironically, the moment we committed to spending 4 nights at Big White we had the opportunity to visit both Jasper and Banff within a 3-week period (read more here). Our boys are still too young to take ski lessons (Connor is only 1 years old) so that means we have to take turns on the hill. Nicole went up the first day with a ski host named Rick, a long time resident of Kelowna who splits his time between Big White and Kelowna. This was Nicole’s first time snowboarding in almost 4 years. She’s been either pregnant or nursing each of the last 3 seasons. Cam went up with Rick the next day. Here are more photos captured while snowboarding Big White. Big White is known for having short lift lines and light, dry champagne powder. It offers a wide variety of terrain, from deep powder bowls to wide-open glades and long groomed trails. The longest run on the mountain, called the Around the World Route, is 7.2 km (4.5 miles) and runs from the top of the T-Bar to Bottom of Gem Lake. It’s a real leg burner! The Summit sits at 2,319m (7,606 ft) and the Village Centre at 1,755m (5,757 ft). The great thing about Big White is that there are plenty of winter offerings besides skiing. Happy Valley Adventure Centre, an area located below the village gondola (the free gondola is a fun ride for kids), is THE place for kids and family activities. Happy Valley Adventure Centre has multiple beginner hills and carpet lifts for little ones to learn to ski or snowboard. And, it’s home to the Mega Snow Coaster Tube Park, Canada’s highest skating rink, a 60-foot ice climbing tower, snowmobiling tours and horse-drawn sleigh rides. We visited the Mega Snow Coaster Tube Park to see if Braydon would be interested in snow tubing. We took him snow tubing last year at Sun Peaks Resort and it freaked him out to the point of tears. He wanted nothing to do with it last year, so we were hopeful his attitude would be different this year. The Mega Snow Coaster Tube Park has 5 specially groomed lanes. Tubes are provided with the purchase of the lift ticket. At 15 months old, Connor was too small to participate (everyone must have their own tube and he’s too small to go alone), so we took turns going down the hill with Braydon. He was a little hesitant at first, but he bravely went along with it. We each sat in our own tube as the lift pulled us to the top of the hill, with one of us holding on to Braydon’s tube. The tubing lanes are actually pretty fast, much faster than we thought they’d be. When we got to the bottom after the first run Braydon turned to me said, “That’s not scary Daddy. That’s fun!” He ended up having a great time. At the base of the tube park was a crackling campfire with free hot chocolate – a nice touch. Another adrenaline-filled activity is climbing the 60 foot ice tower located in the Happy Valley Adventure Centre. Because we spent our days snowboarding, we scheduled our climbs for the evening, just before the sun went down. Fortunately, Mother Nature showed up and delivered a gorgeous sunset filled with pink, purple and blue. I’d like to say that we sat on the side of that steep ice tower and embraced the magical sunset, but, truth be told, we were too focused on not falling. It’s a lot harder than it looks! Though, it does look pretty hard. Neither of us made it to the top, but we gave it a good shot. It’s a fun activity if you’re looking for some adventure. Braydon really wanted to give it a try but the ice picks were too heavy for him. The staff saw the disappointment in his face and quickly jumped to action. They found him a small pair of crampons and a child size hard hat. He was happy to be “a big boy” like the ice climbers. Super cute. What we love about Big White is that it’s a true ski-in/ski-out mountain, regardless of where you stay. Staying in the village is a great option for families because it’s close to restaurants, pubs, shopping, kid activities, chair lifts and the main lodge. We stayed at the Chateau Big White, conveniently located in the heart of the village and directly beside the top of Plaza Chair lift. This was the first time I’ve had a chair lift take me directly to my hotel. In the above photo, if you look to your left, beside the hotel (that’s the Chateau Big White), you will see a small fence. That’s where the Plaza Chair disembarks. From there, you walk 20 feet to the hotel entrance. You can’t get much more convenient than that! We stayed in suite 409, which was the perfect fit for our family size and needs. It has a full kitchen and dining table, two bathrooms, and two separate bedrooms – one with a queen bed, the other with two bunk beds. Braydon loves bunk beds, so he was pretty excited about sleeping on the bottom bunk (it only took 4 head bonks before he figured out you can’t stand up on the lower bunk bed). The suite overlooks the village centre (the above picture was captured from the living room of the suite), which provided entertainment for the boys when the groomers cleaned the village snow each morning. There are plenty of great dining options in the village. We spent our first evening at the Black Diamond Bar & Grill, located on the ground floor of the Chateau Big White. We also had lunch at the restaurant because our hotel gave us two complimentary drink tickets (we have a strict policy to never say no to free beer). I highly recommend the grilled Caesar salad with a Tree Brewing Beach Blonde Lager – it’s a perfect pairing. We enjoyed a lovely dinner at Globe Café, located directly across from the Chateau Big White. 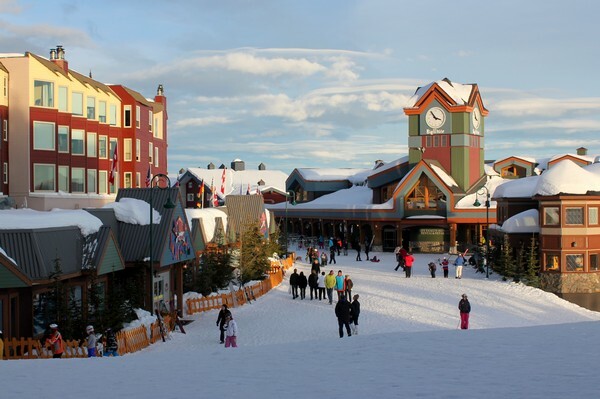 That’s the great thing about Big White Village – everything is within 100 meters. We sampled a variety of delicious tapas, including seared scallops, tuna tartare, potato croquettes and bruschetta – pictured above. We also enjoyed traditional Irish pub fare at the Blarney Stone Irish Tavern. The steak and Guinness pie is the real deal – go for it! The kids menu was a big hit with our boys because it offers traditional dairy free sausages. Both boys love sausages but finding ones that are dairy free can be a challenge (Connor is allergic to dairy and eggs). Our time at Big White was filled with plenty of winter fun. From snowboarding to ice climbing to snow tubing to fine dining. 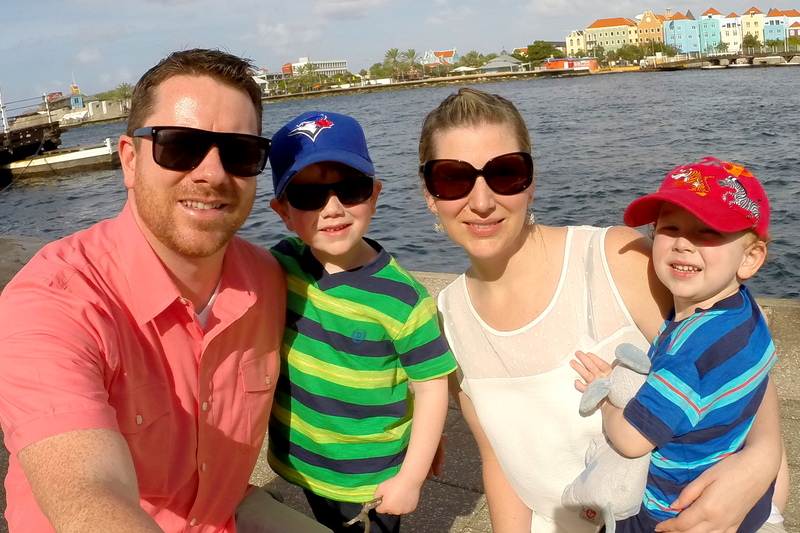 We love that Big White embraces family travel and creates a welcoming atmosphere for those with little ones – it’s so refreshing and it makes a world of difference. If you plan to visit Big White Ski Resort, be sure to check out its calendar of events because there’s always something going on. During our stay, the mountain hosted a Carnival night for the kids that included bouncy castles, games, popcorn and cotton candy, all free of charge. Here’s the link. Your turn! Share your favorite ski resort in the comments below and tell us what you love about it. That time we took a ride on the Polar Express to the North Pole! The Best Road Trip from Vancouver for first time visitors Winter fun at Sea to Sky Gondola in Squamish, British Columbia Great Canadian Bucket List – PLUS an awesome giveaway for you! Downhill skiing is a bit of a challenge with three in tow so we’ve been enjoying cross country skiing instead. We really like Nickle Plate Nordic Ski centre up close to Apex, which is apparently another decent hill… although much less “resort” like up there. We really would love to try cross country skiing. It sounds like a ton of fun! Heard winter’s been a bit of a bust on the West Coast of Canada. Glad to see that you found some winter fun! The town looks so happy with the snow covered roofs, the food there also looks amazing. This sounds amazing! I can’t believe I have never been to a ski resort. I definitely have to!